This is an introductory blog to inform everyone of my affiliation with ANSA-EAP and the work I am currently undertaking. With regard to background, I am an economist who has spent some time (close to 20 years) at the Asian Development Bank (ADB) in various positions. 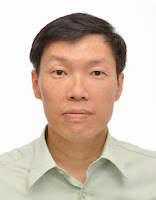 I am presently on leave from the ADB, was earlier affiliated with the Lee Kuan Yew School of Public Policy at the National University of Singapore, and am now working with ANSA–EAP. The main purpose of this leave is to look deeper into the challenges of local government transformation in Indonesia, my country. By extension, the transformation of the public sector needs to be anchored on imbuing results-focused management in public organizations. By further extension, citizens—the ultimate clients of public services—need to play a key role if results focus is to be effectively installed in the government. The research that I am conducting is intended to be a practical one. The approach relies on dialogue with stakeholders on a proposed design of an accountability network. This is for a local government in Batam Island, Indonesia. The assessment takes advantage of the experiences of organizations pursuing accountability (through the use of community indicators, report cards and the like) in India, Canada, and the Philippines. Following design refinements, a trial setup of the network will be conducted to further understand the nuances of network operations. One of the known problems and intended area of contribution for the study is on sustainability and ways for the citizen accountability movement to grow with local community support—both moral and financial. Although the case study is local, I hope the study has value regionally or even globally. Five layers. This blog is written is as a reflection on discussions I had with potential local funders (businesses) and colleagues who have interest in upgrading public administration and citizen involvement in the endeavour. The discussions touch upon 5 layered questions. Why choose results-oriented work? 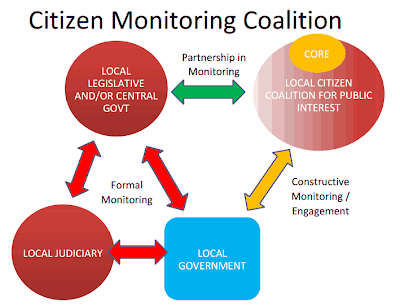 First, lay persons not involved in citizen accountability need to be oriented and even be convinced of its “logic cascade”: that government performance, management quality and governance in Indonesia is the main barrier to progress, rather than access to finance, poor policies, or deficiency in institutions. There is a further need to communicate why a persistent and credible results monitoring system is the first and foremost element needed to embark on the rather complex process of government transformation—and the transformation of societies. Setting up monitoring systems usually is a straightforward step although it may take more time than originally planned. One must also be ready to discuss the attractiveness of funding citizen accountability initiatives in addition to the “more standard” activities that community funders are interested in, such as charities (e.g., scholarships, health missions, disaster relief, etc.). Accountability initiatives are either done by citizens alone or in partnership with government agencies. Conflict of interest. The second group of questions relates to the identity of the network being planned. There are understandable concerns among potential supporters about hidden motives that underly citizen monitoring such as partisan politics, business agenda (i.e., to generate consultancy opportunities), or simply to create new fields of employment for some people. Affiliation and personal background of the network’s founders and trustees are important to potential funders. If a network comes together from a diverse background (multiple universities, sectors, varied religious and political affiliations), this would inspire more confidence, not only for potential funders but also for the local government and the public. Although there are indeed enough citizens–qualified ones at that–in Batam who are interested in activism, pulling them from a diverse background into one network is the main challenge. Cooperation amongst champions. One issue that has to be resolved prior to further dialogue with potential funders is how to accommodate all proponents of the network in a fair and satisfactory manner. Operationally, this translates to material benefits for those who lend substantial work, time and influence to the network. Although great recognition and material benefits are usually not the primary motivation for citizens to be involved, the prospect of equitable distribution of benefits is very important. Network supporters need to be screened, in a sense, based on their expected “benefits” to be acquired from and potential contributions to network. To remain cohesive and inclusive, there may be a need for network proponents and supporters to take turns in occupying influential and/or paid positions–at least among those who are interested. However, at the same time, the network needs to maintain institutional knowledge and grow its technical expertise to prosper. Career paths of staff also need to be defined more clearly in order to attract and retain talent for the network. Connected to this, the study is also looking at activities of social enterprises as a possible source “parallel careers” for those who are interested to be involved long-term in citizen activism. Constructive engagement. Once the above 3 groups of questions about “network identity” (or who we are) are answered, a network should have a better chancce to chart its operations and, hopefully, raise community-based funding. To be effective in bringing about actual change, the network should reach out and be able to work constructively with government agencies that can implement work on the ground and channel issues through elected representatives, so long as the network safeguard its non-partisan status. This is easier to achieve if the network has its own sources of funding. To grow its community stature, there is a logic for advocacy networks to help mobilize citizens to assist government in solving problems–rather than just monitoring, evaluating, and dialoguing activities. However, active assistance must also be done without overstretching the capacity of the network or hampering the ability of the network to objectively evaluate the work it has participated in. Fending off vested interest. The final area to discuss with potential funders is how a network can manage a possible “push back” from powerful groups with vested interests within the society (e.g., coalition of individuals from the public sector and businesses), especially those that stand to lose from changes in government transformation. One way the network can address this is to openly announce the potential challenge and even threats that the network can face from such entrenched interests. At the same time, in a fairly large and cosmopolitan local area, such as Batam, there is a possibility that more than one vested interest group exists. Elements within interest groups can be invited to work with the citizen network for a longer term win-win cooperation that can help stabilize economic growth and pursue a path that will be equally financially rewarding for businesses. This process depends on the stakeholders and the specific power balance involved in each area. As an option, areas with an overwhelmingly dominant vested interest groups may be avoided as initial seeding ground for citizen accountability networks. As outcomes of a power rebalancing initiatives is difficult to predict, many network supporters appear to prefer an “adaptable” path forward for governance improvement. It is not very clear though what this adaptable path is and how it might be implemented. The five sets of queries show that network building, including building its support, is an elaborate but a doable process. The study I am working on will proceed with its interviews, analysis and field trial, and now, it is in an even better position with my affiliation with ANSA–EAP. I will keep everyone posted on how this study progresses. Emile is an economist who is currently researching sustainable networking with ANSA–EAP. As a matter of personal interest, he is studying how to build a citizen accountability network for Batam Island in Indonesia. Emile hails from Jakarta, Indonesia.